The world has been ending for some time now, so it’s only right that US TV drama should take note. The ill-fated Jericho didn’t really get going, but now three major series have set out to realise the breakdown of society during the apocalypse/post-apocalypse: The Walking Dead, Falling Skies and Terra Nova. Given the names behind the scenes – the latter two series are executive produced by Steven Spielberg and The Walking Dead has, or at least had, Frank Darabont in a similar role – expectations ran high, yet the results have been somewhat underwhelming. The end comes variously. 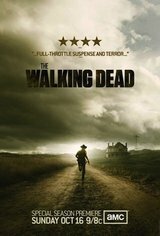 AMC’s The Walking Dead follows the spread of a zombie virus across the US, and stars Egg from This Life (Andrew Lincoln) as police officer Rick Grimes. Yet despite a number of strong performances, the story soon became flaccid and uninteresting. Season 2 is just under way in the States and will hopefully pick up. TNT’s Falling Skies didn’t even start well, skipping over the crucial alien invasion entirely and beginning in medias res – which might have been a bold move, if it weren’t for the ho-hum nature of this survivalist fantasy. The hero of the piece is Noah Wyle’s Tom Mason, an ex-history teacher who is now an officer in an Earth militia combating the aliens, calling themselves the ‘Skitters’. The show’s creator Robert Rodat has made a career out of presenting middle-class liberal everymen who turns to violence at the beck of some higher calling. With irritating regularity, Mason points out some inspiring historical allegory or other to lend gravitas to what is essentially silly nonsense about aliens taking over the world. Fox’s Terra Nova is perhaps the daftest of the three. Taking a post-apocalyptic approach, it starts in a dystopian future where the human race can’t breath the Earth’s air or have more than two kids, yet a crack in space time means the Shannon family can somehow rewind to a survivalist prehistoric Eden, complete with Stephen Lang and dinosaurs. It doesn’t help that the two-part pilot episode is mainly taken up by what happens in course of the first 24 hours of the family’s arrival. Family may well be the issue here. All of these dramas feature, at their centre, a family construct: the Shannon family of Terra Nova, the Mason family (history teacher dad and two sons) in Falling Skies and the Grimes family of The Walking Dead. Apart from some infidelity in the latter, it’s all about as wholesome as Little House on the Prairie. How many times can we be expected to give a damn when the teary-eyed state “I thought I’d lost you”, or through gritted teeth snarl “I’ll do anything to protect my family”? The problem with the above is that it drains everything of dramatic tension. Spielberg’s remake of War of the Worlds (2005) is a guilty precursor here. (WARNING: Contains spoilers) When Ray Ferrier’s young son Robbie runs off to join the war effort – and is effectively running towards his own death – that should have been the emotional heart of the film, yet the cake was eaten and in the last five minutes regurgitated back onto the plate for us. In other words, there is no real danger in any of the aforementioned series as no member of the core families is ever credibly going to be offed – least not until the end of season four. Catastrophe has got all too cosy. The survivalist fantasy is always just that – a fantasy. We pretend that we’re interested in nightmare scenarios, yet they’re nightmares shorn of any real danger, dressed in baggy clothes and set in comfortable, familiar settings. Doomsday has been domesticated, to our loss.